Branson, MO and Pigeon Forge, TN. It is also a standing testament to the fact that legends can dream. Dolly Parton, the legend, owner, creator and dreamer of Dolly Parton's Stampede, has spoken often about her dream-come-true. “I wanted to recreate the family fun of my childhood, when we’d gather for a friendly competition then enjoy a more-than-filling meal,” said Parton. As anyone who has been there can tell you, her dream has been realized. The 35,000 square foot arena has seen 25 years of laughs and awe-struck crowds, and with 1,100 seats, the place continues to fill up with its many fans in Branson, MO as well as Pigeon Forge, TN. 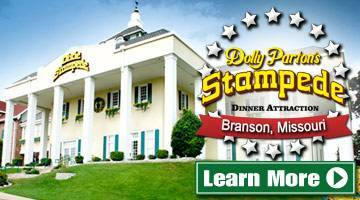 Known for its 'Fabulous Four-Course Feast,' Dolly Parton's Stampede offers excellent meals served by costumed Civil-War era soldiers. The Food Channel explains the grandeur of the meal in numbers: “In peak season, the Stampede stages up to 5 shows daily. That’s 4,400 one-pound rotisserie chickens, 1,000 pounds of pork tenderloin, hundreds of pounds of fresh cut potatoes, ripe corn and ten gallons of soup each day.” In a year, that’s 60 tons of pork, 60 tons of potatoes and 200 tons of rotisserie chicken. “If that sounds like a lot,” states The Food Channel, “it is—but it’s all quite good. And just when you’re thinking ‘man, my fingers are really greasy,’ along comes our server, Union soldier Aaron with a warm wet nap…” No one leaves Dolly Parton's Stampede hungry. This dinner show sells out often and early, therefore we highly recommend that you reserve early! 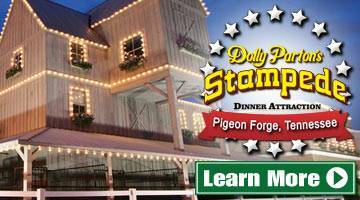 Purchase tickets to Branson's Dolly Parton's Stampede or Pigeon Forge’s Dolly Parton's Stampede online or toll-free at 1-800-987-9852. There are packages available that include lodging as well. Whether you plan on a day trip or a week-long vacation, Vacations Made Easy is here to help make it easy.